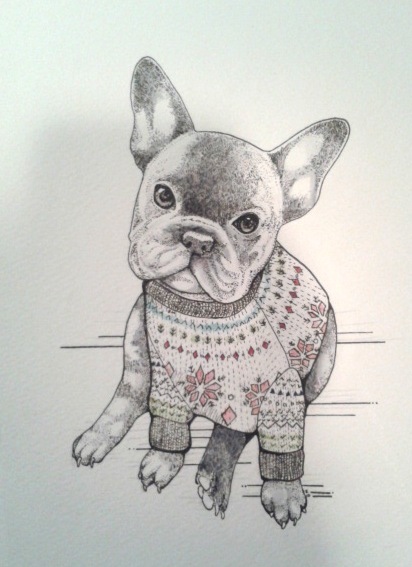 I was recently commissioned to create an original illustration for a christmas card featuring a French Bulldog. 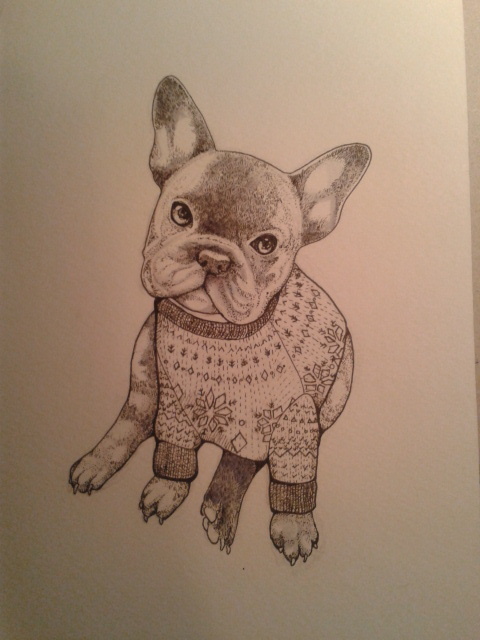 I decided on a cute french bull dog and because it's christmas and there is a massive christmas jumper trend at the minute I decided the little guy shouldn't be left out! So he's got his own designer jumper too. So, Using my usual intricate style of small mark making with fineliner I started to shade him in, using small dots and lines close together to create the variations of texture and shade. Once I had completed the mark making, I felt he needed a little more depth and tonal contrast. So using a bit of ink and water I shaded in the areas of shadow, particularly the forehead and legs, Next stage.... Colour. A little bit of subtle colour on his jumper and he's finished! What do you think?